A Graduate Student Ambassador will be both a representative of their respective University and the JHR. The opportunity to gain marketable experience in the operations of a peer-reviewed, open-access academic journal: Ambassadors get the unique opportunity to experience a behind-the-scenes look at the review and publishing process by being involved in some of our on-going academic initiatives, like the JHR-CHEP Student Essay Contest. Advance skills in program planning and implementation: Ambassadors are required to host at least two events over the course of their tenure, allowing the opportunity to explore interests within the area of the humanities and rehabilitation while being a vital component to the mission and vision of the JHR. Cross-Discipline Collaboration: One of the goals of the Graduate Student Ambassador program is to improve collaboration between disciplines. As a JHR Graduate Student Ambassador, you will serve an instrumental role in achieving this goal while building relationships among faculty, staff, and other students. My name is Amy Samuelson and I am from Sioux City, Iowa. I am a 3rd year physical therapy student at Creighton University and I heard about the Journal of Humanities in Rehabilitation when I spoke with Dr. Blanton at the Combined Sections Meeting. While conversing in a quaint coffee shop with paintings hung on the wall, a wave of peace came over me while I thought about my love for music and the arts. Using the practice of “See, Think, Wonder”, we discussed what the paintings meant to each of us and it was interesting to hear everyone else’s viewpoints. We all can look at the same painting or listen to the same piece of music, but each have our own interpretations of the art. Our own interpretations can vary from day to day based on our moods as well. We can apply this type of observation to our clinical practice. This led to our discussion about humanities, which I think is critical, regardless of profession. We all need to be active listeners, which includes putting our patients first without casting judgment. I am excited to be an ambassador for the Journal of Humanities in Rehabilitation because I am interested in the humanities and I want to share the importance of them with others. We can all benefit from learning more about the them and from one another. If we can incorporate the humanities into our practice of caring for others, we can lead the way to a positive experience overall. 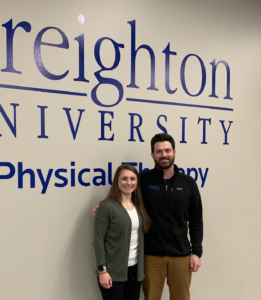 My name is Thomas Myers and I am a 3rd year physical therapy student at Creighton University. I am interested in raising awareness and understanding the role of the humanities in higher education. I encourage other students to find ways to further integrate the humanities into their physical therapy programs. I look forward to using this opportunity as way to help people develop a positive overall emotional well-being and welcome others to be positive influences in their communities.